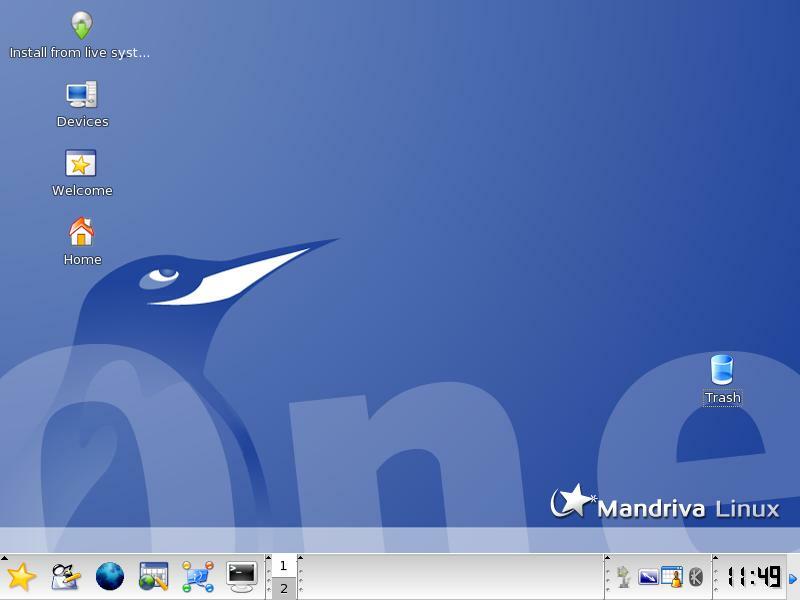 A livecd from popular Linux distribution company Mandriva hit mirrors and the press yesterday and being a Mandriva fan, I just had to test it. Unfortunately I won't be able to sing its praises this day. It was a disappointing experience from first link click to finally rebooting my machine out of it. It was based on Mandriva 2006, so I suppose I was expecting more usability. Let me recount my experience with this livecd. I tried several mirrors, and I never could get a decent download speed. Thus explains why this review is posted so long after the announcements. Once it was finally all here, it did burn without issue. I wish I could say the same for its initial boot. As Texstar advised in his post I experienced that kernel panic upon boot. I did end up having to tear into my machine and unplug my ide1 slave drive in order for it to boot. How sad. I don't know too many people who are willing to do that every time they want to boot a system. The primary purpose of a livecd is portability. How many folks are even going to have authorization to start unplugging drives on their host systems? At this point I still had high hopes for it. One can forgive one or two little things. However, hope began to fade fast as I saw several failed messages during boot. Upon auto-login, I was presented with an 800x600 desktop. That's just a little too conservative for my tastes. So, my first order of business was to open the Mandriva Control Center to adjust it and get a few screenshots. Unfortunately, it would not open. I ended up editing the file the old fashioned way, with vi I might add. There was no nano included. This inoperative application phenomena was to become a theme. At least 1/2 of the applications in the menu did not open here. Of the ones that did, we found very old versions. OpenOffice is still at 1.1.5 and KDE is still 3.4.2. Some of the applications that would not open include mcc, scribus, planner (whatever app they associate with that menu entry), firefox, digicam, gimp, xsane, gnucash, and ~90% of the sound apps listed in the menu. This is not going well for Mandriva. I had no internet connection upon boot, although a fellow tester reported that his was working upon boot. Video playback was achieved if testing mpegs, but .avis and .movs and .bins weren't supported. Kooka worked fine, as my scanner was detected, but the tv app didn't. This is one of the few distros that actually included a radio application. And to be fair to Mandriva, no distro detects my tv/radio card properly. That same fellow tester reported to me that although he chose English, many applications that did actually open, opened in a foreign language. I didn't test the hard drive installer at this point. I had better luck with MandrakeMove a few years back than their current trial. They certainly need to do a lot more work to this concept for anyone to take it seriously. They probably lost 99% of their hopefuls when it shot a kernel panic at boot. Then with inoperative applications, no compiler and rpm that shot errors, I can see no purpose or use for this livecd at this time. I wish them better luck next time. ADDENDUM: That "fellow tester" I spoke of sent in some shots of the installer and showing the unrecognized language in his menus. He states, "As you can see Firefox is in some strange language. There isn't much to their installer. Just pick a directory and start copying, no way to not select lilo or grub so I cancelled out of it as I didnt want to end up with a non-bootable system." Submitted by ikerekes on Sunday 26th of February 2006 02:16:40 AM. Actually I ended up installing the draklive, (i was mostly interested in the installer) with disasterous result. I didn't want to rip my case apart, so after the first kernel panic, I booted in vmware instead, and choose the simple partitioning (it was just a virtual disk), which was successful and opted for grub on the /dev/hda after that the installer just gave up. (later I mounted the drive from the livecd and there was no /boot/grub/menu.list) I was expecting some feedback (if the bootloader installed or some error message) but nada. It didn't occur to me at that time that the installer didn't ask for a user setup, neither for root password, I just expected the installer finish, so I rebooted. of course the HD install was unbootable. Submitted by Béranger on Monday 27th of February 2006 10:34:50 AM. Re: Well... It's a BETA version! Submitted by srlinuxx on Monday 27th of February 2006 10:36:02 PM. Bear in mind that this is a Beta version! Therefore bugs are supposed to exist! Beta or not, they should have made sure the danged thang would boot and at least most of the apps would open before releasing it.